breeches. I'm going to be making him a brown linen waistcoat soon. 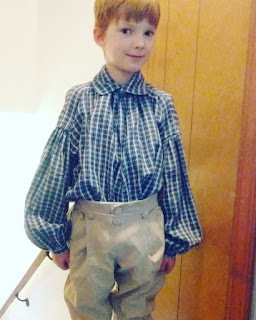 I finally finished my son's 18th century work shirt! We are both really excited. I actually can't believe I finished it - and it was all hand-sewn! As soon as it was done I told myself that I won't be doing that again for some time. I do love my sewing machine! I know it's not accurate, but all of my own 18th century clothes will be done on my sewing machine. Kids' clothing aren't as bad as they're a lot smaller, but I don't think my fingers could take hand-sewing adult-sized clothing. Anyway, this was a great learning experience! I used a pattern company I'd never used before. Their patterns are very well-researched, but I think this particular shirt pattern is more complicated than some. It's a very nice one, though, and the shirt is very sturdy. How historically accurate is it? 95% I'm not sure if they used a lot of cotton thread back then. I didn't have any linen thread that was fine enough. And I think they only used 1 or 2-holed buttons, as the ones I used have 4 holes. It is entirely hand-sewn, and the pattern has some excellent research. It looks really fabulous. Well done. Hand sewing is difficult & more time consuming.